Ah, the mighty Goro! Four arms, cheap moves, broken hearts. Ever wonder what he looks like in real-life? Wonder no more. 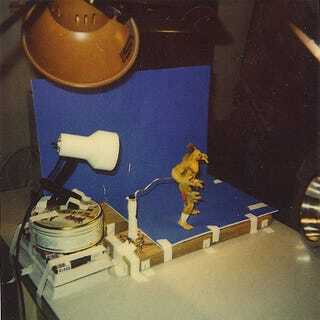 While the rest of Mortal Kombat's cast of in-game characters were digitised actors, Goro obviously wasn't. He was, instead, a stop-motion miniature, whose moves were recorded on the 1990's most cutting-edge recording equipment: a table, a blue screen and a table lamp.